I promised myself to give the whole Berkeley thing a rest, which I plan to do although not before using the last few week’s experience to illustrate a theme I’ve written about in the past (although not much on this blog): the sacrifice BDS demands of those institutions it tries to bring into the fold. When the leadership of Mainline Protestant churches like the Presbyterians and Methodists were embracing divestment between 2004 and 2006, they did not do so simply as organizations with multi-billion dollar pension and retirement funds looking to modify their ethical investment policy to include the Middle East. Rather, their pronouncements on the matter were written in the most religious of rhetoric, again and again noting that their political divestment program was coming from a sacred place, was (using a phrase that’s appeared again and again in their communication) an example of “bearing witness” to human suffering. It is no accident that the Palestinian organizations (notably the Sabeel Eccumenical Liberation Theology Center) which lobbied these churches for years provided a religious (rather than a political framework) to undergird the Presbyterian and Methodist divestment projects. For someone making a political choice can always change his or her mind. But if you’re asked to place everything you hold sacred onto the alter, to claim that a political choice is actually a religious requirement, it then becomes harder (if not impossible) to reverse course, even when doubt over the effectiveness or morality of your choices comes to the fore. In both these cases, the cost for these sacrifices has been high. In the UK, teachers have faced one economic blow after another during the last few years. Yet the one thing that would give this union a moral platform when asking for public support (their devotion to academic freedom) was jettisoned years ago to make room for their impotent attacks on the Jewish state. And when was the last time political leaders or the media turned towards the Presbyterians or Methodists for answers to moral or religious questions of the day? At Berekely, it seems that battle lines of the recent divestment debate were drawn between the two major political parties in student government. Now I won’t pretend to understand that political landscape in any great detail (having been surprised that any university can sustain organized political parties for decades, as has Berkeley). But while the party that’s been driving divestment votes (called CALSERV) would never consider itself a wholly own subsidiary of Student for Justice in Palestine (SJP), I suspect that SJP does not return the favor. And so, even with the vote all-but lost the BDS partisans have used parliamentary maneuvers to ensure the issue gets dragged out for weeks on end, hoping that they can sway (i.e., bully) a crucial Senator needed to override the veto that doomed divestment weeks ago. And, possibly in violation of the Senate’s rules, these meetings have been held behind closed doors. 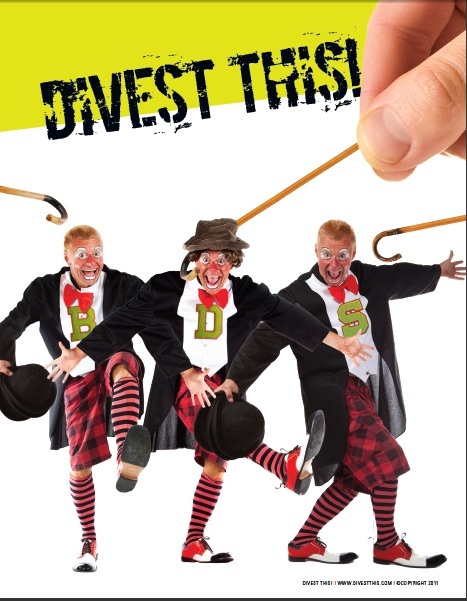 While I can understand the desire to avoid more circuses like the recent all-nighters where the fate of divestment was recently debated, it seems the decision to go behind closed doors was made to allow some kind of BDS “surprise” resolution to be put on the books before the year is out. Why the rush? Well apparently the other major campus political party (Student Action), which has pretty much stood against BDS during the recent conflict, won a handy majority in an election that fell right in the middle of the whole divestment brouhaha. In other words, rather than taking their recent loss at the polls as a possible example of students having a say on the divestment matter, the pro-boycott partisans are doing everything they can to stuff the BDS message into the mouth of that student body before their term expires. So just like with the churches or the unions, student government is being asked to sacrifice the things upon which their authority rests (in this case, democratic responsibility), hiding behind closed doors in order to ram something down the campus’ throat, even after it seems pretty clear that they have no mandate to do so. No doubt the pro-divestment Senators would claim that they are “bearing witness,” that a higher calling requires them to bend or break the rules in order to screw their constituents. But, in fact, they are simply being asked by their SJP/BDS handlers to throw everything under the bus: the rules, their reputation, those people they claim to serve, not to serve a higher calling, but to do something that the boycotters (and the boycotters alone) are telling them is their only moral choice.